Managing Complex Conditions in Home Health is a complete manual through which staff can prevent declines and adverse events through sound patient planning, while ensuring reimbursement and positive outcomes for their home health agency. 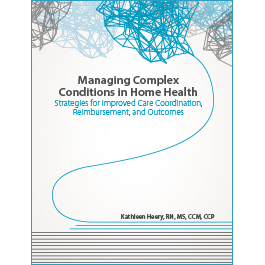 Home health patients with chronic, complex conditions present care coordination challenges that are hard to overcome without proper understanding and training. Poor coordination and planning for these patients can result in poor patient outcomes, rehospitalizations, poor star ratings, and lower reimbursement. 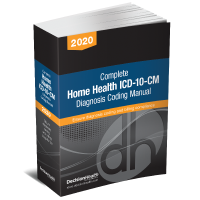 Managing Complex Conditions in Home Health is a complete manual through which staff can prevent declines and adverse events through sound patient planning, while ensuring reimbursement and positive outcomes for their home health agency. This manual discusses multiple payer and reimbursement solutions, frontline clinical care techniques for chronic disease management, care coordination strategies, and patient engagement for lifestyle and behavioral changes. Kathleen Heery, RN, MS, CCM, CCP, is a small business owner and consultant providing community case management and homecare service support to elders, their families, and other providers. She is a certified case manager with more than 30 years of professional healthcare and eldercare experience. Heery is a founding partner of the Elder Life Care Network™ in Plymouth, Massachusetts, which is building a new model for eldercare by leveraging proven case management techniques and innovative technologies that connect and communicate with cross-continuum providers.